THE SOURCES: THE SUMERIAN LITERARY TABLETS DATING FROM APPROXIMATELY 2000 B. C.
The study of Sumerian culture introduced by the present volume, Sumerian Mythology, is to be based largely on Sumerian literary sources; it will consist of the formulation of the spiritual and religious concepts of the Sumerians, together with the reconstructed text and translation of the Sumerian literary compositions in which these concepts are revealed. 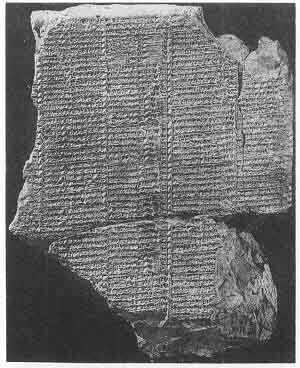 It is therefore very essential that the reader have a clear picture of the nature of our source material, which consists primarily of some three thousand tablets and fragments inscribed in the Sumerian language and dated approximately 1750 B. C. a It is the first aim of the Introduction of the present volume to achieve such clarification. It therefore begins with a brief sketch of the rather rocky road leading to the decipherment of the Sumerian language and continues with a brief résumé of the excavations conducted on various Sumerian sites in the course of the past three-quarters of a century. After a very brief general evaluation of the contents of the huge mass of Sumerian tablet material uncovered in the course of these excavations, it turns to the Sumerian literary tablets which represent the basic material for our study, and analyzes in some detail the scope and date of their contents. The Introduction then concludes with a description of the factors which prevented in large part the trustworthy reconstruction and translation of the Sumerian literary compositions in the past; the details, not uninteresting in themselves, furnish a revealing and illuminating commentary on the course and progress of one of the more significant humanistic efforts of our generation. which proved to be one of the factors in hampering the progress of Sumerology to no inconsiderable extent. For in the case of Egypt, Assyria, and Babylonia, the investigating scholars of western Europe had at their disposal much relevant material from Biblical, classical, and postclassical sources. Not only were such names as Egypt, Ashur, and Babylon well known, but at least to a certain extent and with much limitation and qualification, even the culture of the peoples was not altogether unfamiliar. In the case of the Sumerians, however, the situation was quite different; there was no clearly recognizable trace of Sumer or its people and language in the entire Biblical, classical, and post-classical literature. The very name Sumer was erased from the mind and memory of man for over two thousand years. The discovery of the Sumerians and their language came quite unexpectedly and was quite unlooked for; and this more or less irrelevant detail was at least partially responsible for the troubled progress of Sumerology from the earliest days to the present moment. [paragraph continues] Achaemenid proper names as handed down in Biblical and classical literature, the German scholar, Grotefend, succeeded in deciphering a large part of the Persian version of the inscriptions. Additions and corrections were made by numerous scholars in the ensuing years. But the crowning achievement belongs to the Englishman H. C. Rawlinson. A member of the English Intelligence Service, Rawlinson was first stationed in India, where he mastered the Persian language. In 1835 he was transferred to Persia, where he learned of the huge trilingual inscription on the rock of Behistun and determined to copy it. The Persian version of the Behistun inscription consists of 414 lines; the second, now known as the Elamite version, consists of 263 lines; while the third, the Accadian (designated in earlier Assyriological literature as Assyrian or Babylonian--see note 3) version, consists of 112 lines. During the years 1835-37, at the risk of life and limb, Rawlinson succeeded in copying 200 lines of the Persian version. He returned in 1844 and completed the copying of the Persian as well as the Elamite version. The Accadian inscription, however, was so situated that it was impossible for him to copy it, and it was not until 1847 that he succeeded in making squeezes of the text. 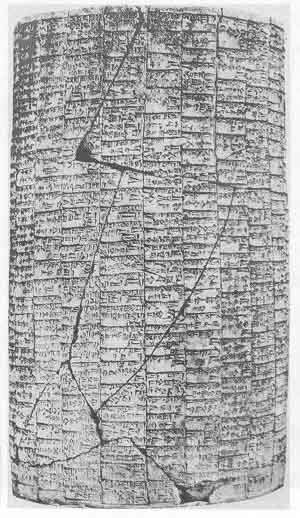 To return to the decipherment of cuneiform Persian, by 1846 Rawlinson published his memoir in the Journal of the Royal Asiatic Society, which gave the transliteration and translation of the Persian version of the Behistun inscription together with a copy of the cuneiform original. 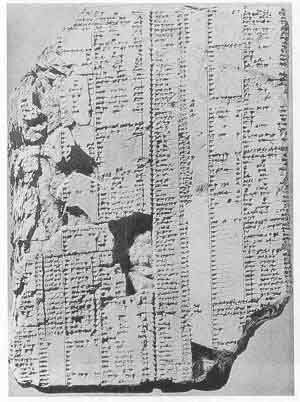 [paragraph continues] Layard was uncovering at Nineveh a large number of inscribed clay tablets. By 1850, therefore, Europe had scores of inscriptions coming largely from Assyrian sites, made in the very same script and language as the third version of the Persepolis and Behistun inscriptions. The decipherment of this language was simplified on the one hand by the fact that it was recognized quite early in the process that it belonged to the Semitic group of languages. On the other hand, it was complicated by the fact that the orthography, as was soon recognized, was syllabic and ideographic rather than alphabetic. The leading figure in the decipherment of Accadian, or Assyrian as it was then designated, was the Irish scholar Edward Hincks. But once again a major contribution was made by Rawlinson. In 1851 he published the text, transliteration, and translation of the Accadian version of the Behistun inscription, the large trilingual to whose text he alone had access. As for the second, or Elamite version, of the Behistun inscription, it offered relatively little difficulty as soon as progress was made in the decipherment of Accadian, since it uses a syllabary based on the Accadian system of writing. The major figures in its decipherment were Westergaard and Norris. As early as 1855 Norris, the secretary of the Royal Asiatic Society, published the complete text of the second version of the Behistun inscription, which had been copied by Rawlinson, together with a transliteration and a translation; this remained practically the standard work on the subject until Weissbach published his Achämenideninschriften zweiter Art in 1896. MAP 1. SUMER IN THE FIRST HALF OF THE THIRD MILLENNIUM B. C.
The Sumerians were a non-Semitic, non-Indo-European people who probably entered Mesopotamia from the east prior to or during the fourth millennium B. C. At the time of the Sumerian invasion much of the land between the Tigris and the Euphrates Rivers was no doubt inhabited by the Semites, and the entrance of the Sumerians marked the beginning of a struggle between the two peoples for control of the two-river land, which lasted for some two millennia. To judge from our present data, victory first fell to the Sumerians. There is reason to assume that at one time the Sumerians were in control of the better part of Mesopotamia and that they even carried their conquests into more distant lands. It was no doubt during this period of conquest and power in the fourth millennium B. C. that the Sumerians made important advances in their economic, social, and political organization. This material progress, together with the growth and development of the spiritual and religious concepts which accompanied it, must have left an enduring impress on all the peoples of the Near East who came in contact with the Sumerians during the fourth millennium. But the early defeat of the Semites by the Sumerians did not mark the end of the struggle between the two peoples for the control of Mesopotamia. No doubt with the help of new invasion hordes from the Arabian peninsula, the Semites gradually regained some of their strength and became ever more aggressive. And so in the first part of the third millennium we find the Sumerians being gradually pushed back to the more southerly portion of Mesopotamia, roughly from Nippur to the Persian Gulf on our map. North of Nippur the Semites seemed well entrenched. 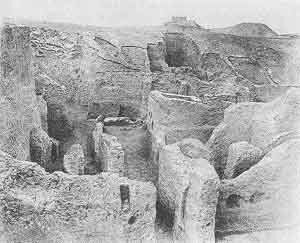 [paragraph continues] Lagash, an excavation which has been conducted by French archaeologists intermittently and with long interruptions almost to the present day. It was at this site that the first important Sumerian monuments were excavated, the objects and inscriptions of the ishakkus or princes of Lagash. Here more than one hundred thousand tablets and fragments were dug up, dating from the pre-Sargonid and Ur III periods." PLATE I. A SCENE FROM THE NIPPUR EXCAVATIONS: ROOMS OF THE TEMPLE "TABLET HOUSE." In the history of American archaeology, the Nippur expedition, organized by the University of Pennsylvania more than 50 yean ago, will always be remembered with special interest and regard. For it was the Nippur excavations, supported over a number of years by a relatively small group of Philadelphians of unusual vision and understanding, which were responsible to no small extent for making America "archaeology-conscious." Moreover, it was largely the interest and enthusiasm aroused by the Nippur discoveries that led to the founding and organizing of the University Museum, an institution which for almost half a century has proved to be a leading pioneer in all branches of archaeological activity. [paragraph continues] Iraq under the auspices of the University of Pennsylvania. Nippur, one of the largest and most important mounds in Iraq, was chosen, and four long and extremely difficult excavating campaigns were conducted during the years 188990, 1890-91, 1893-96, and 1896-1900. The hardships and handicaps were severe and discouraging. One young archaeologist died in the field, and there was hardly a year in which one or the other of the members of the expedition did not suffer from serious illness. Difficulties with the Arab tribes were not infrequent and at times assumed a most threatening character. In spite of the obstacles, however, the excavating continued, and in the course of the four campaigns which lasted more than a decade, the expedition achieved magnificent and in some respects unparalleled results, at least in the inscriptional field. 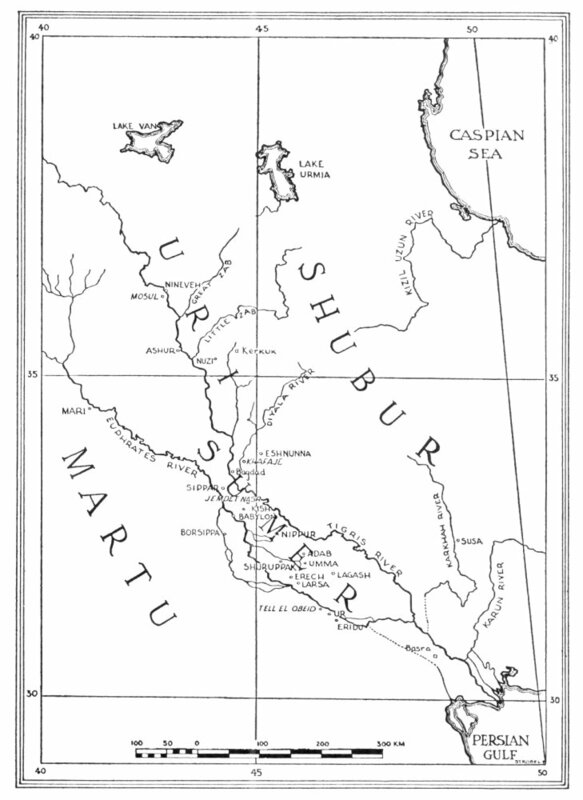 The Nippur expedition succeeded in excavating approximately thirty thousand tablets and fragments in the course of its four campaigns, the larger part of which are inscribed in the Sumerian language and date from the second half of the third millennium to the first half of the second millennium B. C.
The contents of these tablets are rich and varied. The greater part is economic in character; it consists of contracts and bills of sale, promissory notes and receipts, lists and accounts, wills, adoptions, court decisions, and other legal and administrative documents. Many of the tablets are letters; some are historical inscriptions; still others are lexical in character, that is, they contain Sumerian dictionary and grammatical material of priceless value for our study of the language, since they were actually compiled by the ancient scribes themselves. But especially noteworthy is the large group of tablets dated about 1750 B. C. a which are inscribed with the Sumerian literary compositions consisting of epics and myths, hymns and laments, proverbs and "wisdom." 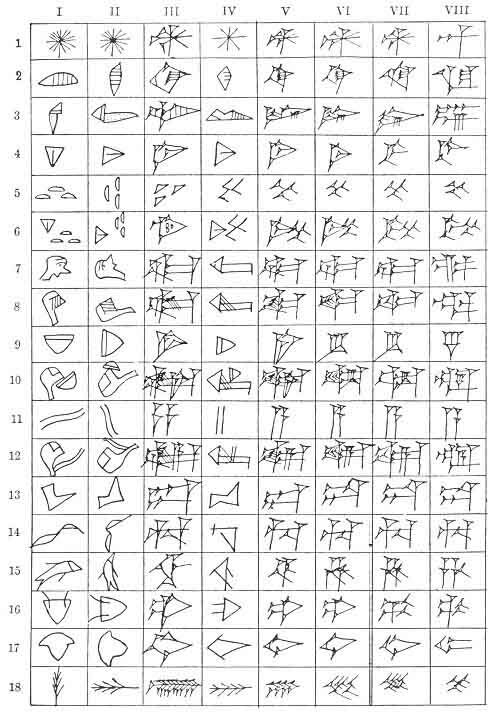 This brief survey furnishes a bird's-eye view of the Sumerian inscriptional finds uncovered and brought to light by legitimate excavations. d In addition, scores of thousands of tablets have been dug up clandestinely by the native Arabs in the mounds of Sumer, especially in the ancient sites of Larsa, Sippar, and Umma. It is therefore difficult to estimate the number of Sumerian tablets and fragments now in the possession of the museums and private collections; a quarter of a million is probably a conservative guess. What now is the nature of the contents of this vast accumulation of Sumerian inscriptional material? What significant information can it be expected to reveal? The remaining two thousand and one hundred tablets and fragments, by far the major part of our Sumerian literary tablets, were excavated by the University of Pennsylvania at Nippur some fifty years ago. Of this number, over one hundred have found their way to the University of Jena in Germany; approximately eight hundred are in the possession of the Museum of the Ancient Orient in Istanbul; almost eleven hundred are located in the University Museum at Philadelphia. 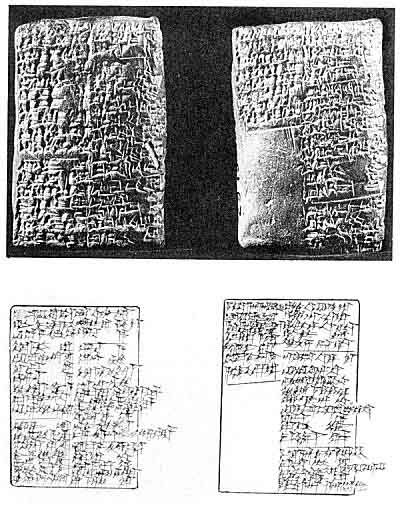 It is no exaggeration to state, therefore, that it is the Nippur expedition of the University of Pennsylvania which is to be credited in large part with the recovery and restoration of the ancient Sumerian literary compositions as written down at approximately 1750 B. C. It is well worth noting that these Sumerian literary creations are significant not only for their remarkable form and illuminating contents. They are unique, too, in that they have come down to us as actually written by the scribes of four thousand years ago, unmodified and uncodified by later redactors with axes to grind and ideologies to satisfy. Our Sumerian literary compositions thus represent the oldest literature of any appreciable and significant amount ever uncovered. 1. Hymn of King Shulgi (approximately 2100 B. C.). 2. Hymn of King Lipit-Ishtar (approximately 1950 B. C.). 3. Myth, "The Creation of the Pickax" (see p. 51). 4. Hymn to Inanna, queen of heaven. 5. Hymn to Enlil, the air-god. 6. Hymn to the temple of the mother-goddess Ninhursag in the city of Kesh. 7. Epic tale, "Gilgamesh, Enkidu, and the Nether World" (see p. 30). 8. Epic tale, "Inanna and Ebih" (see p. 82). 9. Epic tale, "Gilgamesh and Huwawa." 10. Epic tale, "Gilgamesh and Agga." 11. Myth, "Cattle and Grain" (see p. 53). 12. Lamentation over the fall of Agade in the time of Naram-Sin (approximately 2400 B. C.). 13. Lamentation over the destruction of Ur. This composition, consisting of 436 lines, has been almost completely reconstructed and published by the author as Assyriological Study No. 12 of the Oriental Institute of the University of Chicago. 14. Lamentation over the destruction of Nippur. 15. Lamentation over the destruction of Sumer. 16. Epic tale, "Lugalbanda and Enmerkar." 17. Myth, "Inanna's Descent to the Nether World" (see p. 83). 18. Perhaps a hymn to Inanna. 19. Collection of short hymns to all the important temples of Sumer. 20. Wisdom compositions describing the activities of a boy training to be a scribe. group of literary compositions for purposes of reference essential to the storing and filing of the respective tablets. 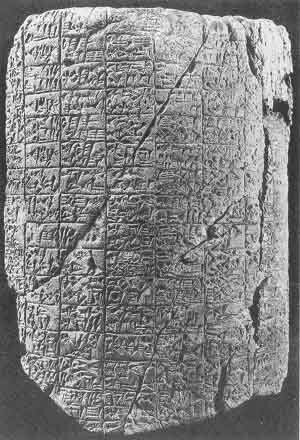 The cuneiform system 17 of writing was probably originated by the Sumerians. The oldest inscriptions unearthed to date-over one thousand tablets and fragments from the latter half of the fourth millennium B. C. which were excavated in Erech in very recent years-are in all likelihood written in the Sumerian language. But whether or not it was the Sumerians who invented the script, it was certainly they who in the course of the third millennium B. C. fashioned it into an effective writing tool. Its practical value was gradually recognized by the surrounding peoples, who borrowed it from the Sumerians and adapted it to their own languages. By the second millennium B. C. it was current all over the Near East. The cuneiform script began as pictographic writing; each sign was a picture of one or more concrete objects and represented a word whose meaning was identical with, or closely related to, the object pictured. The defects of a system of this type are obvious; the complicated form of the signs and the huge number of signs required, render it too unwieldy for practical use. The Sumerian scribes overcame the first difficulty by gradually simplifying and conventionalizing the form of the signs until their pictographic origin was no longer apparent. As for the second difficulty, they reduced the number of signs and kept it within effective limits by resorting to various helpful devices. The most significant of these consisted of Substituting phonetic for ideographic values. The table on the opposite page was prepared for the purpose of illustrating this two-fold development in the course of the centuries; a detailed description will be found in note 18. To judge from the script, the Nippur cylinder illustrated on this plate (8383 in the Nippur collection of the University Museum) may date as early as 2500 B. C. Although copied and published by the late George Barton as early as 1918, 20 its contents, which center about the Sumerian air-god Enlil and the goddess Ninhursag, are still largely unintelligible. Nevertheless, much that was unknown or misunderstood at the time of its publication is now gradually becoming clarified, and there is good reason to hope that the not too distant future will see the better part of its contents ready for translation. This plate (from E. de Sarzec, Découvertes en Chaldée (Paris, 1889-1912), pl. 37) illustrates one of the two Gudea cylinders dating from approximately 2250 B. C. They were excavated by the French at Lagash more than half a century ago, and both cylinders are now in the Louvre. They are inscribed with long hymns to the god Ningirsu (another name for the god Ninurta--see p. 80) and his temple in Lagash. The style of the composition is highly advanced and points to a long preceding period of development, in which much literary material must have been composed and written down. The contents of the two Gudea cylinders were carefully copied and translated by the eminent French Assyriologist, Thureau-Dangin, as early as the first decade of our century. 19 The Sumerological advance of the past several decades, however, makes a new translation imperative. themselves, to judge from the script as well as from internal evidence, were inscribed in the Early Post-Sumerian period, the period following immediately upon the fall of the Third Dynasty of Ur. Just as a rough point of reference, therefore, the actual writing of the tablets may be dated approximately 1750 B. C. a As for the composition of their contents, to judge from the large group of hymns devoted to the kings of the Third Dynasty of Ur, much of it actually took place in that Neo-Sumerian period which lasted approximately from 2150 to 2050 B. C. h Moreover, an analysis of the contents of the hymns inscribed on the so-called Gudea cylinders, 19 which date from approximately 2250 B. C., and of the myth inscribed on an archaic Nippur cylinder published by George Barton, 20 which, to judge from its script, dates considerably earlier than the Gudea cylinders, clearly indicates that not a little of the hymnal and mythological material had already been composed several centuries earlier. Finally, an analysis of the religious concepts as revealed in the building and dedicatory inscriptions of the classical Sumerian period, roughly 2600-2400 B. C., leads to the same conclusion. In short we are amply justified in stating that although practically all our available Sumerian literary tablets actually date from approximately 2000 B. C., a large part of the written literature of the Sumerians was created and developed in the latter half of the third millennium B. C. The fact that so little literary material from these earlier periods has been excavated to date is in large part a matter of archaeological accident. Had it not been, for example, for the Nippur expedition, we would have very little Sumerian literary material from the early post-Sumerian period. We turn now to the ancient literatures which have exercised the most profound influence on the more spiritual aspects of our civilization. These are the Bible, which contains the literary creations of the Hebrews; the Iliad and Odyssey, which are filled with the epic and mythic lore of the Greeks; the Rig-veda, which contains the literary products of ancient India; and the Avesta, which contains those of ancient Iran. None of these literary collections were written down in their present form before the first half of the first millennium B. C. Our Sumerian literature, inscribed on tablets dating from approximately 2000 B. C., therefore antedates these literatures by more than a millennium. Moreover, there is another vital difference. The texts of the Bible, of the Iliad and Odyssey, and of the Rig-veda and Avesta, as we have them, have been modified, edited, and redacted by compilers and redactors with varied motives and diverse points of view. Not so our Sumerian literature; it has come down to us as actually inscribed by the ancient scribes of four thousand years ago, unmodified and uncodified by later compilers and commentators. And so we come to the crucial point. The basic value of Sumerian literature and its fundamental importance for the related humanities being obvious, why has it remained largely unknown; why has it not been made available to scholar and layman? What has hampered and impeded the decipherment of the Sumerian literary tablets? Why has so little progress been made in the reconstruction and translation of their contents? The factors responsible for this unfortunate situation are twofold: linguistic, the difficulties presented by the grammar and vocabulary of the Sumerian language; and textual, the problems arising out of the physical characteristics of our source material. First, the linguistic difficulties. Sumerian is neither a Semitic nor an Indo-European language. It belongs to the so-called agglutinative type of languages exemplified by Turkish, Hungarian, and Finnish. None of these languages, however, seems to have any closer affiliation to Sumerian, and the latter, therefore, as yet stands alone and unrelated to any known language living or dead. Its decipherment, therefore, would have been an impossible task, were it not for the fortunate fact already mentioned that the Semitic conquerors of Sumer not only adapted its script to their own Semitic tongue, but also retained it as their literary and religious language. As a consequence, the scribal schools in Babylonia and Assyria made the study of Sumerian their basic discipline. They therefore compiled what may be described as bilingual syllabaries or dictionaries in which the Sumerian words or phrases were translated into their own language, Accadian. In addition they also drew up interlinears of the Sumerian literary compositions in which each Sumerian line is followed by its Accadian translation. Accadian, being a Semitic tongue related to numerous known languages, was deciphered relatively early. And so these bilinguals became the basic material for the decipherment of Sumerian, for by comparing the known Accadian word or phrase with the corresponding Sumerian, the meaning of the latter could be deduced. The dictionaries and syllabaries compiled by the Babylonian scribes to aid their study of the Sumerian language, which formed their basic discipline, varied considerably in make-up and structure. One of the most useful types is the "Chicago" syllabary, a scientific edition of which was recently published by Richard Hallock, of the Oriental Institute. 23 It is illustrated on plate V, which is reproduced here by permission of the University of Chicago Press. It was inscribed in the latter part of the first millennium B. C., although the indications are that it was actually compiled sometime in the second millennium B. C. Each side of the tablet is divided into two halves, and each half is subdivided into four columns. The second column contains the cuneiform sign to be explained, while the third column gives the name by which the Babylonian scribes identified it. The first column writes out phonetically the Sumerian word which the sign represents, while the fourth column gives its Semitic translation. But troublesome and distressing as the linguistic problems frequently are in the process of reconstructing and translating our literary tablets, they are not insuperable. The major impeding factor, the most serious stumbling block, is the textual problem. Tablets, and especially those inscribed with the Sumerian literary compositions which are largely unbaked, rarely come out whole from the ground. Usually they are in a fragmentary, and not infrequently in a very fragmentary condition. Offsetting this disadvantage is the happy fact that the ancient scribes made more than one copy of any given composition. The breaks in one tablet may therefore frequently be restored from duplicating pieces which may themselves be mere broken fragments. Thus in the case of "Inanna's Descent to the Nether World" (see p. 83), I utilized fourteen different fragments. In the case of the recently published "Lamentation Over the Destruction of Ur," 15 the text was reconstructed from twenty-two different fragments. And in reconstructing "The Feats and Exploits of Ninurta" (see p. 80), I utilized 49 different fragments. To take full advantage of these duplications and the consequent restorations, however, it is essential to have as much as possible of the source material copied and available. But of the Nippur literary tablets excavated by the University of Pennsylvania and now located in Istanbul and Philadelphia, some two thousand in number, only about five hundred have been copied and published to date. And while all of the approximately seven hundred pieces in the British Museum, Louvre, Berlin Museum, and Ashmolean Museum have been copied and published, 12 some of the more important texts did not appear until a relatively recent date. Under these circumstances, the trustworthy and scientific reconstruction and translation of our Sumerian literary compositions on any major scale was obviously impossible. I first realized this situation and its implications in 1933, almost a decade ago, while working in the Oriental Institute of the University of Chicago as a member of its Assyrian Dictionary staff. For in that year died Edward Chiera, the scholar who copied more of the Nippur literary material than all others combined. Long a member of the faculty of the University of Pennsylvania, he devoted much of his time and energy during his stay there to the copying of more than two hundred literary tablets and fragments in the University Museum. Later, when called to the rapidly expanding Oriental Institute of the University of Chicago as head of its Assyrian Dictionary project, he took his copies with him, and the Oriental Institute undertook to publish them in two volumes. Upon Chiera's untimely death, the editorial department of the Oriental Institute entrusted me with the preparation of these two posthumous volumes for publication. 27 As the significance of the contents dawned upon me, I realized that all efforts to translate and interpret the material would remain scientifically inadequate unless and until more of the uncopied and unpublished material lying in Istanbul and Philadelphia should be made available. by numerous scholars working in the Museum in the course of the past four decades. Of these six hundred and seventy-five pieces, approximately one hundred and seventy-five are inscribed with epic and mythological material; some three hundred are hymnal in character; fifty are parts of lamentations; the remaining one hundred and fifty are inscribed with proverbs and "wisdom" compositions. In the past two years my efforts were concentrated largely on the epics and myths. By utilizing all the available published material, together with that part of the unpublished material which I copied in the Museum of the Ancient Orient at Istanbul and all the relevant unpublished material in the University Museum at Philadelphia, I succeeded in reconstructing the larger parts of the texts of twenty-four Sumerian epics and myths; 28 this is the basic source material for the restoration of Sumerian mythology to be sketched in the following chapters. As for the scientific edition of these epics and myths, that is, editions consisting of the reconstructed Sumerian texts with line by line translations and commentary, these are now in the process of preparation; unless the work is unexpectedly interrupted, they should be completed in the course of the coming two or three years.